Humla is considered one of the most remote and isolated regions in Nepal, reachable only by foot or small aircrafts which are irregularly landing in the district head quarter, Simikot. It is situated high in the Himalaya, in the Karnali Zone, North-western Nepal, bordering the Tibetan Autonomous Region. Humla has a size of 5.655sq/km a population of about 50,000 (2011).The region is one of the most underdeveloped areas in Nepal with only one hospital and campus and few higher secondary schools in Simikot serving the whole district. Most of the villages of Humla don't have access to electricity, communication (telephone, mobile service, internet), clean drinking water, qualified and good education, proper health care etc. The average altitude is about 3,000m above sea level. Humla is the highest district in Nepal, with most villages lying at about 3,000m-5,000m above sea level. The climate is harsh, with snow for up to four months of the year. Only 1% of the land is arable, due to the rocky terrain. There is practically no irrigation, the soil is poor, and the land is very dry and arid. The growing season is short, all of which contributes to low agricultural yields. Severe food shortages are a result of population growth (due to lack of access to family planning services), climate change and poor soil fertility. On average, most households only produce sufficient food for 3-5 months of the year. The poorest groups in society, such as women, persons with disability and low caste households face additional hardships. Small huts, open fires and families living with the animals on mud floors is the norm in the countryside. The common means of transportation are mules which bring required products from the Tibetan border to Simikot. The district headquarter of Humla is Simikot, at an elevation of 2945 meters. It is situated high above the Humla Karnali River and is surrounded by high snow-covered peaks. Simikot is the gateway to the Holy Mt, Kailash and Lake Manosarober trek, which takes about 3-5 days walk up to the Tibetan border. According to the national sensus 2011, Humla has total polulation of 50,800. The citizens of Humla are known as Humli. The ethnic composition of Humla is similar to most of the High Himalayan districts. The majority of villages are populated by Hindus, mainly Chettris, Brahmins, Thakuris and occupational castes, particularly in the southern part of the district. However, the northern part of district is populated by a Tibetan ethnic group, which is referred to as Lama in the region. 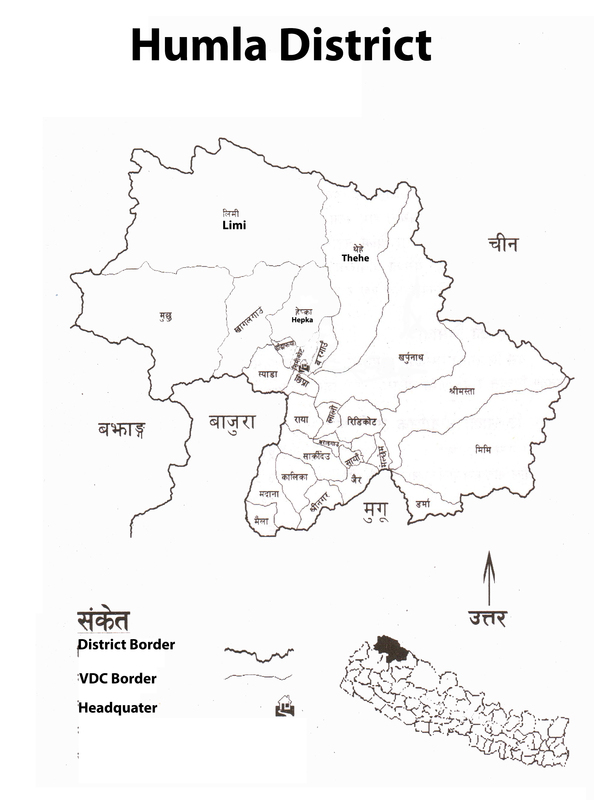 The district has the following ethnic composition: Chhetri (44.2 %), Thakuri (19.5 %), Lama (16.1%), Brahmin (6.2 %), and the occupational casts such as Kami (Black Smiths-5.66 %) Damai (Tailors-2.36 %) and Sarki (Cobblers-1.2 %). The Lama ethnic group practices polyandry marriage system, which is now disintegrating gradually due to various internal and external factors such as modernization, education, social and cultural-mixe with other groups and so on. The Dalits (locally called Dom) such as Kami, Sarki and Damai are the lowest caste of Hindu society. They are born into their caste, which was originally based on their occupation. Dalits are still persecuted not only in Humla but in the whole Nepali and Indian society, unable to enter temples, use the same water tap or well or associate with most people, especially the so-called higher caste people. They endure social exclusion, discrimination, food shortages, lack of education, and violence. The Language spoken in the district is Humli Khas spoken by 84.38% of the total population, while Lama Kham (closed to the Tibetan Language) is spoken by 15.32 % of the population. It is believed that the Nepali language has its origins in Humli Khas. The religions in Humla are Hinduism (78.2 %) and Buddhism (20.2 %). Humla has a domestic airport at Simikot, which is the only one way out form here.It connect with Surkhet, Nepalgunj, and Kathmandu, the main cities of the country by air. Air distance between Nepalgunj and Simikot is 218 km. The Airport can only give services to small aircraft such as twin otter and helicopter due to its short runway. Air service depends on the weather of Humla and Nepalgunj , therefore, connections are neither regular nor reliable. The district is inaccessible by motor roads. The second and final option to reach Humla is on foot. If one wants to reach Simikot via land, s/he needs to go through Jumla or Mugu districts. It takes one day by bus with rough track road from Nepalgunj to Jumla/Mugu. And, it needs 5 to 7 additional days of trekking to reach Simikot from there. However, it is very hard to follow this route due to the complex geographical condition of the region. Karnali Curridoor and a road from Tibet to Simikot is still under construction. It would be a milestone to link this remote area with the giant neighbour China/Tibet and the rest parts of the country. The construction works have started, but they are yet to be completed. So the people of Humla still dream to have access to the modern means of transportation. This video was caputred and edited By Nirmal Bistawhen the head Family were in the picnic near the simikot Dadafya, The mues are transporting wood for housng. Since there is few mordern transportation vehical available in Humla which is not effortable for Normal people. So people use the horse back and Muel as their transportation system. Simikot airport is a small airport located in Simikot Bazar. This Airport link Humla with other place. Otherwise there is no any road link to other part of the Nepal. In size airport is small and cand land and take off only one plane at a time and only park hardly six plane. Flight are erraguler her due to the uncertain weather. When the weather get clear flight are rushed here and do some stupid things like this shown as in video.Captured by Bugslaw Marek. Currently, most products are brought to Simikot from Tibet. The main means of transportation are mules that carry huge loads on the three days journey from the Tibetan boarder to Simikot. Rice is mainly flewn in by airplane. As a consequence, many products are much more expensive than in the country average due to transportation costs. The overall level of education in Humla is poor. According to the latest statistical report from District Education Office Humla, the literacy rate of Humla is 47%. Many people, particularly women and persons with disability are illiterate. Approximately 40% of children never go to school due to poverty. In two thirds of the district, there is no secondary school. Only 2.6% of children pass the SLC, the final exam of seconndary education. In Humla, many schools lack basic infrastructure such as blackboards, desks and chairs, teaching equipment, and skilled and motivated teachers. Only a few students can afford pencils or copy books. District Education Office Humla and some NGOs like Good Neighbors Humla, The Himalayan Innovative Society, ISIS/IC Foundation, KIDARC etc. are working to support the community schools to improve quality of education and Head Nepal and Sahara Group are working to take care of special needs of children with disabilities in Humla. Humla is rich in natural resources especially forest products, Non Timber Forest Products (NTFPs) and Medicinal and Aromatic Plants (MAPs). Due to the altitudinal and climatic variation, there are the following types of forests: Coniferous Forests (48.80 %), Hard wood Forests (4.14%), Mix Forests (41.00 %) and Shrub lands (6.06 %). Many plants have medicinal values, however efforts for conservation and knowledge about their correct use are needed for their sustainability and the economical development of the district. The study of District Irrigation Office in Humla shows that there are more than 50 rivers in the district. The major river is Humla Karnali. These rivers have the potential to generate hydropower upto 10,300MW. However, these resources have not yet been explored.